Paying for private school is a big investment. And only you and your family know what you can and cannot do as it comes to affording private education. Financial aid is a need-based option and is just one of the ways families afford private education. Before you even start the process, make sure to chat with the school’s financial aid director and introduce yourself. You can email, call or set up an appointment. While this person is not going to approve your application over the phone or guarantee your qualification for aid, it will still help them to be able to put a face to a name as you go through the process. They will also be able to answer any questions you have about the other payment options out there (payment plan, 529s, etc.) to help you determine the right option for your family. There are many deadlines throughout the financial aid application process. 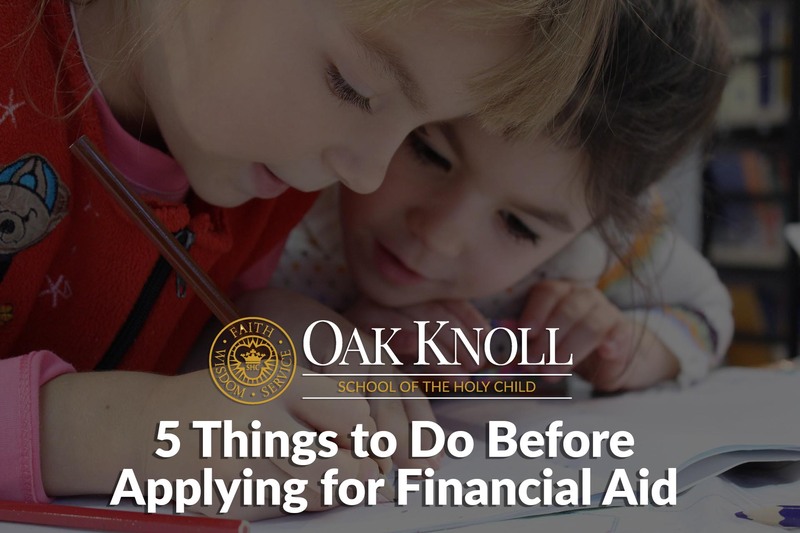 At Oak Knoll, for example, there are three deadlines: In December, the application and initial supporting documentation are due; followed by the prior year’s W-2s in February; and your most recent filed federal tax return in March. Most schools outline this process on their website, so be sure to check that out. As mentioned above, there are a lot of required documents, so it is important that before you apply for financial aid, you have gathered as much of it as you can. Some schools require as many as three years’ worth of tax returns, including the 1040, all attachments and W-2s. You will also likely need recent paystubs and to fill out the 4506-T tax form. Lastly, most schools are going to require that you submit your most recent filed federal tax return. As the process generally takes place during the winter, that means you will need to get used to filing your taxes early. At Oak Knoll, we ask families to submit their most recent filed federal tax return in March. Finding the right school for your child and family can be a stressful process. There is no need for the financial aid application to add to that burden. We hope our five tips will provide you with some relief and understanding of the process. When in doubt, always consider reaching out to the director of financial aid with any questions. They’re there to help make your lives easier! READ ALSO: Interested in learning more about the many ways to afford private education? Read our other blog post, Paying for Private School: 5 Options.